AFAIK the Soviets used several types of artillery tractors during WWII - "Komsomolets", "Komintern", "Voroshilovets", "Stalinets" and others. Despite this is not a very common topic for discussion, it is possible to find the photos and specifications of those tractors in the literature. But I have several questions - could anybody provide me with information about the Soviet self-propelled guns and other special vehicles, based on those tractors (I know only ZiS-30 based on "Komsomolets" chassis)? Also which Soviet cannons and howitzers did each of those tractors mainly tow (I mean the classification of the artillery tractors in Soviet Army - light, medium or heavy....)? And any information about their using by Wehrmacht is welcome (especially photos)! Last edited by BIGpanzer on 12 Aug 2005 17:44, edited 4 times in total. Well there was also SU-45.A Komsomoletz with 45mm gun. Here what I found about Soviet artillery tractor T-20 “Komsomolets”. 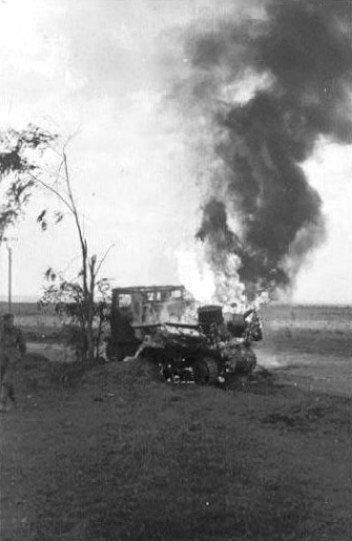 That was a light mobile artillery tractor (weight 3,46 t + 0,5 t load (including 6 men in addition to 2 men crew) + 2 t trailer) with 50-52 hp engine GAZ-M, 48 km/h speed and range 152-200 km. T-20 was mainly used for tow the 37mm and 45mm AT guns and 76mm regimental gun. Its predecessor was high-speed light artillery tractor “Pioneer” (based on “Marmon-Herrington” design and Soviet light amphibious tank T-37A chassis) with weight only 1,5 t, 1 man crew + 6 men of gun’s crew, 40 hp, 50 km/h. Near 50 “Pioneers” were built in Moscow in 1936. But they were unstable at turns, had low tractive force and were insufficiently armored. So experimental armored “Pioneer” B-1 and “Pioneer” B-2 were developed soon, but were overweight. 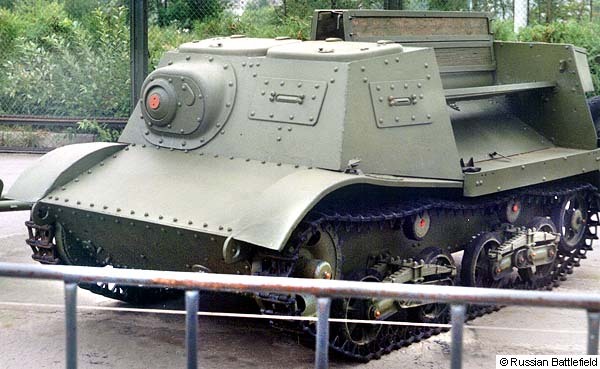 Much more successful was high-speed armored light artillery tractor T-20 “Komsomolets”, which was developed in 1936, using amphibious tank T-38 chassis with modified springs and truck GAZ-AA units (engineer N.Astrov). “Komsomolets” had 7-10 mm armor and 1 x 7,62mm MG (1008 shells) at the front. The engine located behind. “Komsomolets” had also 6 seats for the gun’s crew and awning with windows. There were three serial modifications of T-20 “Komsomolets”, differ in the construction of guide roller, seats, cargo platform, armament and air intake. The main defect of this quite good tractor was a low-powered car engine. 7780 T-20 “Komsomolets” were produced in 1937-1941 in Moscow, Gorky and Stalingrad. They played a great role in motorization of Soviet light artillery units (6700 T-20s were in Soviet Army in June 1941, each of infantry division should have 21 "Komsomolets"). They used very often as MG tankettes during the first period of WWII and as light tractors by partisans. The losses of “Komsomolets” were high and in September 1942 there were only 1662 T-20s in Soviet Army. Also 101 AT self-propelled guns ZiS-30 with 57mm AT gun ZiS-2 were produced in 1941 in Gorky, using “Komsomolets” chassis and hull. ZiS-30 were the first real serial Soviet SP guns and used quite successfully against German tanks during the Battle for Moscow in 1941 by AT batteries of 20 tank brigades. But they were overweight (3,96 t) and unstable during firing because of small base and high hull of “Komsomolets” (so folding bearings were used), also they had an open hull. May be this is a mistake, anyway I couldn't find any info about such SP gun. AFAIK experimental SU-45 with 45mm AT gun (weight 4,2 t, 3 men crew) was developed exactly by the same plant, where “Komsomolets” produced, but in 1936 (“Komsomolets” were produced in 1937-1941) and using light amphibious tank T-38 chassis and hull, not “Komsomolets”. 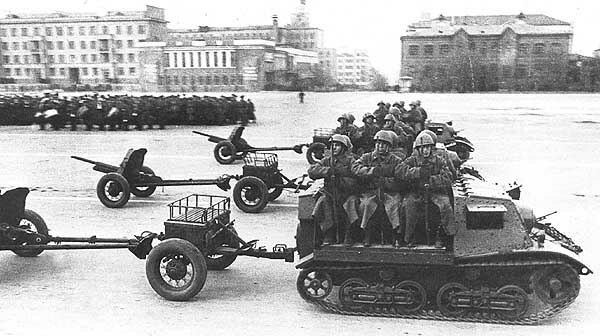 Also several experimental light unarmored artillery tractors were developed during WWII: LT-1 (50 hp) and LT-2 (76 hp) in Moscow; GAZ-20 “Komsomolets-2” (60 hp) and GAZ-22 (85 hp, based on T-40 chassis) in Gorky. All of them had the hull from GAZ-MM truck and could tow more heavy divisional cannons and AA guns. The trophy “Komsomolets” were used quite active by Finns (Finnish Army had 56 T-20s in 1941 and 184 in 1943) and by Germans as light artillery tractors. 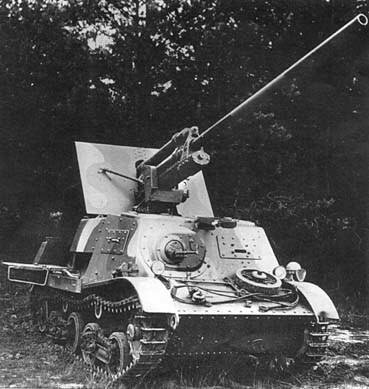 Germans also developed a SP gun, using “Komsomolets” chassis and 37mm AT gun Pak 35/36. Finns used T-20s till 1961 (!). Also Romanians used 34 captured T-20s during WWII. The photo of the Soviet light armored tractor T-20 "Komsomolets"
Last edited by BIGpanzer on 14 Nov 2005 22:42, edited 12 times in total. According the Pekka Kantakoski book Punaiset Panssarit.Puna-Armeijan Panssarijoukot 1918-1945 this is SU-45. Thanks for the photo, that is quite rear as me seems. But I still think this is not a "Komsomolets" chassis (please, compare the suspensions at the photos). As for "Komsomolets" - all sources only report about ZiS-30 SP anti-tank gun. I need to check the literature, but, probably, this is one of the "tanks", made in blockade Odessa on STZ tractor chassis, covered with iron plates. But this is only my supposition, I will check the info soon and let you know. Last edited by BIGpanzer on 26 Apr 2005 16:49, edited 2 times in total. AFAIK several from 7780 produced T-20 "Komsomolets" survived and preserved now at the Russian and Finnish museums. Russians had one T-20 at Moscow museum of WWII history, Finns - two T-20s in excellent condition. Last edited by BIGpanzer on 26 Apr 2005 16:51, edited 3 times in total. The real SU-45 was a prototype vehicle based on the T-38. The photo marked "SU-45" provided by Juha is actually a KhTZ-16 armored tractor with a 45mm 20K gun. Only a small series was produced in late 1941. 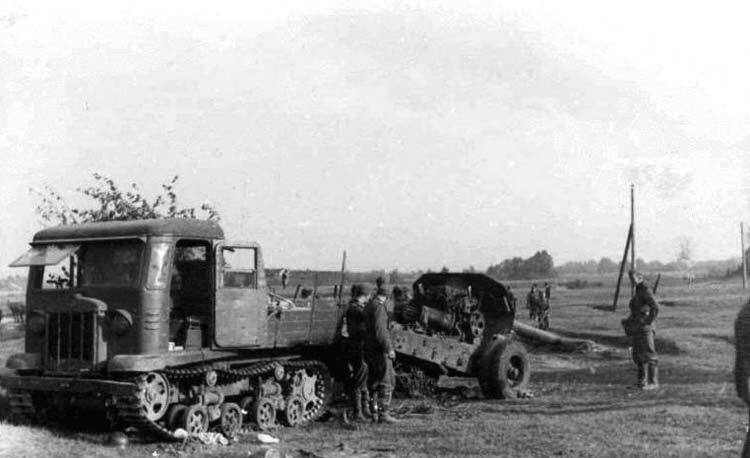 AFAIK, the only other modification done to an artillery tractor besides the ZIS-30 was to the STZ-5 where a BM-13-16 was mounted to it's chassis. As of 1.1.43, there were 1048 T-20 still in Red Army service. As you can see, the Germans also made an SPG based on the T-20. Thanks for the clarification guys.Kantakoski says that few "SU-45" were with SU forces in Karelian Isthmus in 41.Wonder what types they actually were. 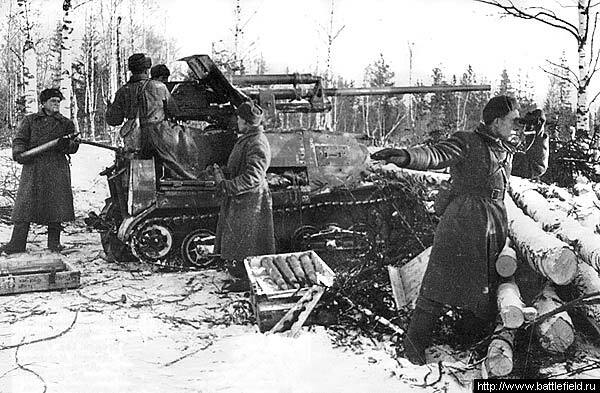 Juha, I think the best candidates for what this Finnish "SU-45" could be: either T-20 or T-37/38 with a mounted Soviet 45mm gun.. given that the Finnish tank forces had sufficient numbers of these types of vehicles on the Karelian isthmus. The actual Soviet SU-45 was only built as a single prototype. Thank you very much for the info about T-20 "Komsomolets" in Wehrmacht service. Excellent and rare photos! I didn't know about that. The transport artillery tractor STZ-5 (STZ-NATI-2TV) was produced in 1937-1942 at Stalingrad tractor factory (so STZ means Stalingradsky Traktorny Zavod = Stalingrad tractor factory; abbreviation NATI means Research Motor and Tractor Institute). 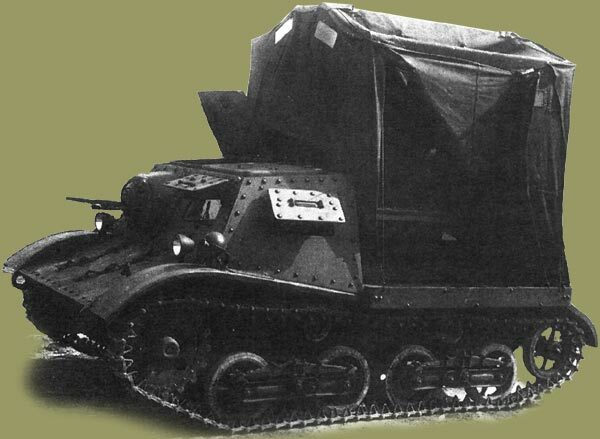 STZ-5 had metal cab with two seats and engine (1MA, 52-56 hp, used petrol or kerosene, with water direct injection) between them and wooden platform with drop sides, benches for 8 gun’s crew, removable tarpaulin awning and capstan under the platform. STZ-5 had weight 6 t + 1,5 t load + 4,5-7,25 t trailer, speed 14-21,5 km/h and range 140 km. STZ-5s used for tow the divisional guns (76mm cannons, 122 - 152mm howitzers, 76-85mm AA guns) in tank and mechanized divisions. 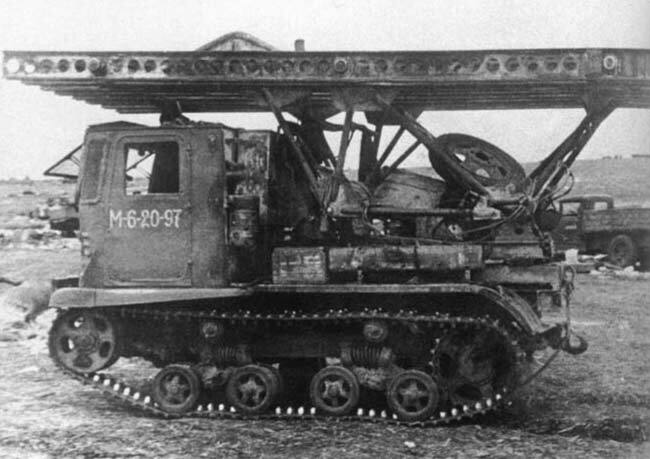 At the beginning of WWII STZ-5 were used also for tow the more heavy guns because of lack of more powerful tractors. It was the most widespread artillery tractor in Soviet Army during WWII (9944 of STZ-5 were produced, Soviet Army had 3438 in June 1941) and was the single artillery tractor, produced in 1941-1942 in USSR. STZ-5s were used as artillery tractors till 1945, later they used as agricultural tractors till late 1950s. 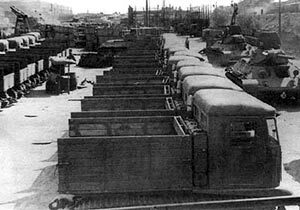 It should be mentioned that several models of army transport and artillery tractors were developed at Stalingrad tractor factory in 1930s, some of them had common units with agricultural tractors. 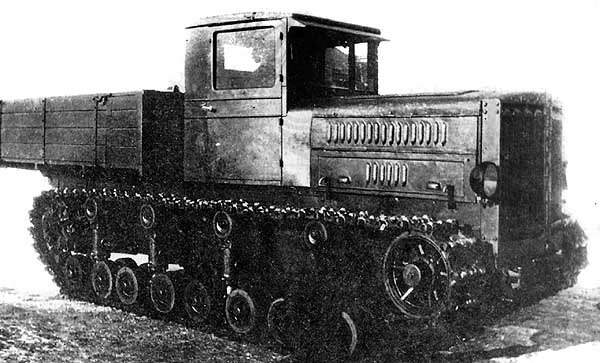 For example experimental universal tractor “Komsomolets” (developed in 1933 and based on Vickers Carden-Loyd design, but it was overweight and unreliable). AS for SP guns, based on STZ-5. VDV already mentioned the rocket mortar BM-13-16 (“Katyusha”) on STZ-5 chassis. They were used for the first time in autumn 1941 near Moscow. Some sources report also about 45mm AT gun, based on STZ-5 chassis. I don't know what is it, no photos...Probably, those were self-made "tanks", we already shortly discussed about. Yes, several self-made “tanks” (STZ-5 or sometimes another tractors with several MGs, light guns and boiler iron plates as armor) were built in fighting Odessa (Black Sea) in autumn 1941. The name of those “tanks” was NI (“Na Ispug” = Fright ). 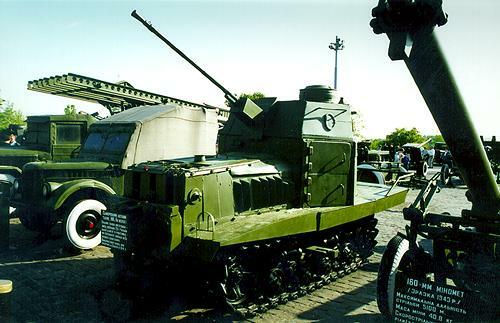 Three of such very unique AFVs survived and preserved at Ukrainian and Russian museums. Last edited by BIGpanzer on 14 Nov 2005 23:03, edited 13 times in total. 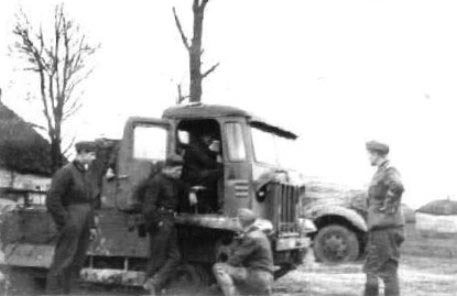 NI armored tractors ("tanks") were based mainly on STZ-5 chassis, as well as on another tractor's chassis also. This photo will be interested for Juha, I hope! Last edited by BIGpanzer on 28 Apr 2005 12:05, edited 2 times in total. Does anybody know how much the rocket mortars of BM-13-16 type, based on STZ-5 chassis, were produced? Also does anybody know any info about preserved transport tractors STZ-5s in museums (photos, please)? 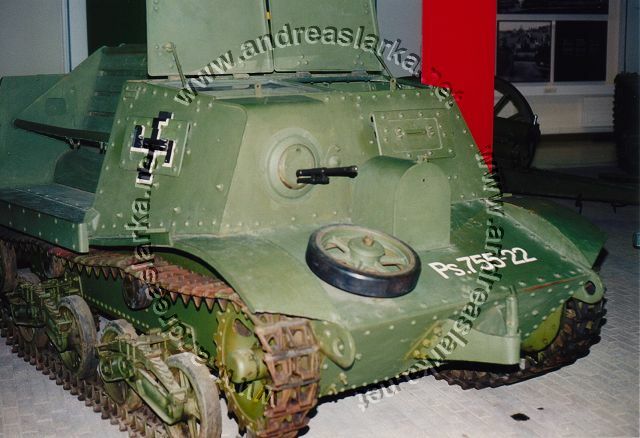 I know only, that three NI "tanks" preserved (see above), but what about the real STZ-5? 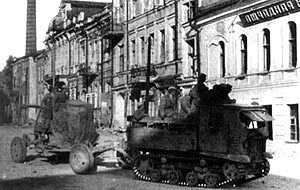 Their losses during the first period of WWII were great, because STZ-5 was the main artillery tractor in Soviet Army. Last edited by BIGpanzer on 28 Apr 2005 12:16, edited 2 times in total. I don't think this was a specific production model - just a simple modification to the original tractor. AFAIK, these were used as support vehicles for Soviet tank and mechanized units. Since the original tractors were already in deficit when the demand for them was great, I doubt that many of them were modified this way. 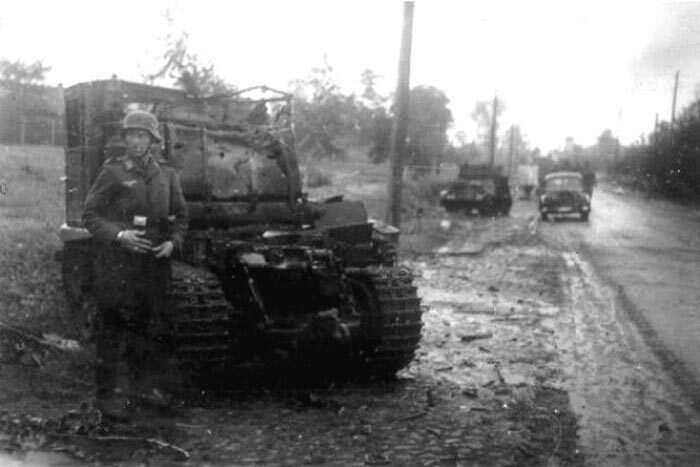 On Sept. 1, 1942, 4678 STZ-5 tractors were still in Red Army service - mostly in artillery units. Specifications: weight 10,5 t + 2 t load + 12-14 t trailer; crew 2 + 12 men; dimensions 5,765 x 2,208 x 2,538 m; base 3,278 m; track 1,53 m; clearance 0,4 m; engine 131 hp; speed 30,5 km/h; range 170 km (550 l of fuel). 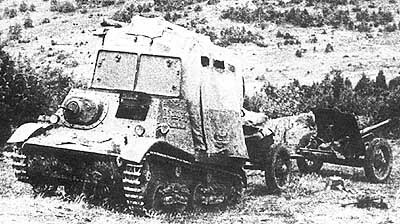 “Comintern” was the first special Soviet artillery tractor with closed cab, platform for ammunition with awning and powerful winch joint with gear-box. 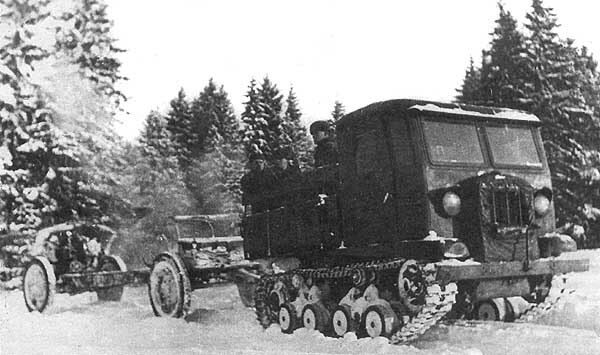 Before its appearance in 1934 the Soviets used the tractors “Communard” (based on German Hanomag VD50 design) for heavy cannons tow, but those were obsolete, not powerful and low-speed. Nevertheless “Communards” were used during WWII in huge amounts also. “Comintern” was produced at Kharkov Tractor and Locomotive Factory in 1934-1940, 1798 were produced. AFAIK no “Comintern” preserved. 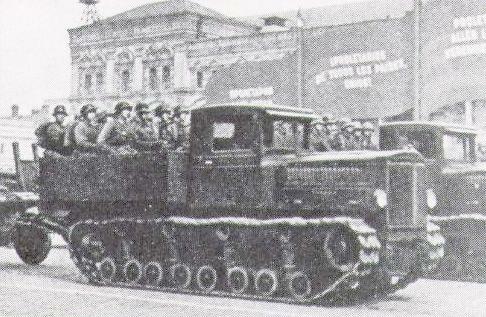 “Comintern” had a special engine KIN, chassis from the small-serial middle tank T-24 and modified cab from ZiS-5 truck. “Comintern” could tow the 152mm and even 203mm heavy cannons and howitzers and used mainly at corps artillery units, especially in the Far East. Some of them were used in civil industry also. In January 1945 there were 568 “Cominterns” in Soviet Army. 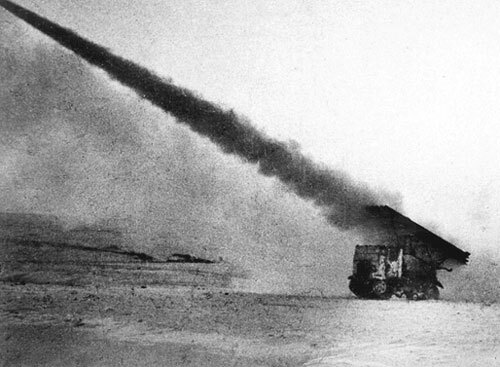 Despite that “Comintern” was very reliable, had a good speed and cross-country ability and considered as one of the best middle artillery tractors of 1930s, its design was obsolete, depletion of fuel was high and it was insufficiently maneuverable. Does anybody have some info about the using of "Cominterns" by Wehrmacht as trophy? Photos of the Soviet medium artillery tractor "Comintern"
Last edited by BIGpanzer on 14 Nov 2005 23:07, edited 5 times in total. Could anybody help me with the photos or any information about Soviet heavy artillery tractor "Voroshilovets" in German service?